Detailing the physical features, habits, territorial reach and other identifying qualities of the Spiny Oak Slug Moth. The stinging Spiny Oak Slug is no where near as sweet to handle as its chocolate-colored and minty green adult form. 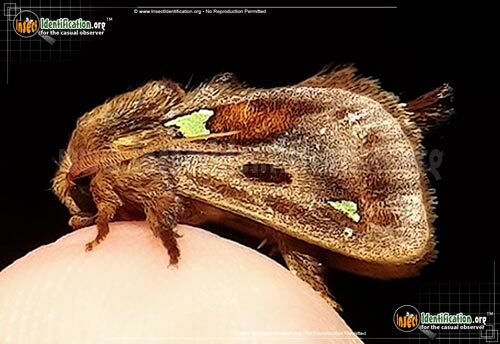 Spiny Oak Slug Moths can be found on or near deciduous forests. Adults are nocturnal, but attracted to lights at night. Their bodies are brown. 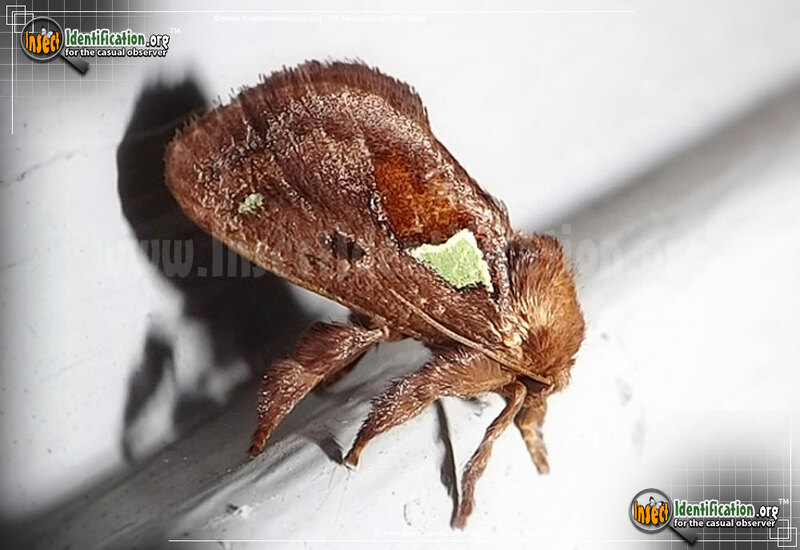 The forewings have patches of minty green, and a dark brown patch as well. The hindwings are brown. They fly from late spring to late autumn in some places. Cold weather limits the moth to one generation in the north, but it can produce two generations in the south. Caterpillars may be light green, yellow, pink tan, or even a reddish-brown. It is wide and flat unlike the more typical tubular caterpillar shape. Rows of yellow or orange stinging spines line the caterpillar from head to rear. Pairs at the head and the rear are longer than those running down the center of the body. These spines contain venom meant to deter predators from eating it. When touched by humans, the spines can embed themselves into skin and cause pain, itching, burning, irritation, and redness. If stung, one should use fresh pieces of (Scotch) tape to help pull the spines out of the skin right away, and ice the area. Covering it with a baking soda paste helps reduce pain and redness by neutralizing some of the venom. Though it is not considered lethal, people allergic to other types of insect stings may have also a serious reaction to this caterpillar that requires medical attention. Despite its name, the caterpillars are not host-specific and feed on thick, old leaves growing on willow, cherry, sycamore, chestnut, redbud and other deciduous trees besides oak. This diverse diet means they are ubiquitous. They are not known to feed on a plant enough to cause any real damage to it.